Transistor is nothing like what I had expected. As SuperGiant Games’ follow-up to the wildly popular, narratively-focused Bastion, Transistor appeared to be the natural progression of the systems and themes established in the studio’s first release. The trailer was all I had to go on before the show, but somehow, I assumed I was in for something familiar when entering the jam-packed booth. However, Transistor is a true departure from what the developer achieved in its last game. It may borrow the visual excellence that was showcased as the Kid built his Bastion, but a heaping tablespoon of strategy has been mixed into this brew of action and story. And the result is something I never knew I even wanted, let alone yearn for after leaving Boston. The young woman introduced in Transistor’s debut trailer has lost what she seems to hold closest to her heart at the opening of the demo – her voice. As a songstress in the colorful city depicted in the game, she’s distraught over her sudden and irreversible silence. 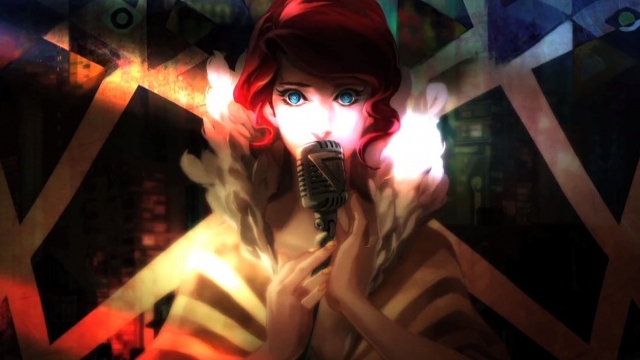 Yet, while she may be muted, Transistor still has a clear voice to tell its tale. The ultimate weapon, which is what the game’s name is based on, can be considered a participant narrator throughout the adventure. Logan Cunningham, the voice of Bastion, has returned to act as the verbal device of SuperGiant Games’ latest venture, but the relationship between this weapon and the protagonist creates a much different tone than what was seen previously. How’s it different? A man’s soul now resides in the weapon, and while he was very recently killed, he’s not entirely dead yet. His consciousness has been inserted into this computer sword, and for the time being, cannot be freed. In a sense, he’s along for the ride, but truly cares for this woman without a voice who’s using his new-found home to dispose of the monsters storming the city. The methods by which the Transistor can be used to do battle are where SuperGiant Games has taken the most apparent creative leap. In real time, players can commit to an action that deals a set amount of damage. There are light attacks that can be executed quickly, heavier attacks that have a greater reach but longer build up and special techniques that erupt from the Transistor with more explosive results. It’s a snappy, responsive system, but that’s just one way to tackle the moment-to-moment drama. Once an action bar at the top of the screen is filled, the Planning Mode can be initiated. Here, time comes to a halt for everything on screen but the owner of the Transistor, and the same types of actions available in the real-time combat can be strung together to create a fleet, potent dose of damage to the enemies on screen. Both this turn-based feature and the real-time aspect of the combat are viable, but blending the two pieces of combat is where the violent dance begins to show its real beauty. Sound design is also top notch, and thankfully, the track heard in the game’s trailer has found a way into the experience itself. The soundtrack works as a powerful complement to the visual design, producing a stimulating sensory package that scratches that Bastion itch we’ve all been dealing with since reaching the end of the Kid’s journey. The more urban motif is seemingly allowing the team to branch out a bit with the style of the environment and enemy design, but you can still expect some beautiful 2D backgrounds to rummage through. After all, the full Bastion team, plus three new faces, are back for this new venture. Transistor is still fairly early in development, so “early 2014” is the only information we have on the release date. With the shifting console generation, platforms are a mystery, too. For now, I can safely say I was floored by what SuperGiant Games brought to PAX East. It’s not often that a game puts a smile on my face by being something completely different than what I had anticipated, but in the case of Transistor, the unexpected direction was a delight.